With October's slight uptick in unemployment on his hands just days before the election, President Obama on Friday made only a glancing reference to the new jobs report in a list of his administration's accomplishments, arguing the case during a Hilliard, Ohio rally, "We have made real progress." After telling of the "heroes" who have inspired him in the aftermath of Hurricane Sandy, the president transitioned: "That idea that we're in this together - It's carried us through the trials and tribulations of the last two hundred-something years, but also the last four years. In 2008, we were in the middle of two wars and the worst economic crisis since the Great Depression. And today, our businesses have created nearly five and a half million new jobs. And this morning we learned that companies hired more workers in October than at any time in the last 18 months. "The American auto industry is back on top," he continued. "Home values and housing construction is on the rise. We're less dependent on foreign oil than at any time in 20 years. Because of the service and sacrifice of our brave men and women in uniform, the war in Iraq is over, the war in Afghanistan is ending, al Qaeda's been decimated, Osama bin Laden is dead. We have made real progress." Mr. Obama's seconds-long mention of the report out Friday is a turn from last month, when he seized on September's jobs numbers, showing a 7.8 percent unemployment rate - the lowest since he took office - as proof of his economic policies' success. October, while reporting better than anticipated job creation, showed a bump in unemployment by 0.1 percentage point. "We've got more work to do," the president acknowledged. "As long as there's a single American who wants a job and can't find one, as long as there are families working harder but falling behind, as long as there's a child anywhere in this country who's languishing in poverty and barred from opportunity, our fight goes on." 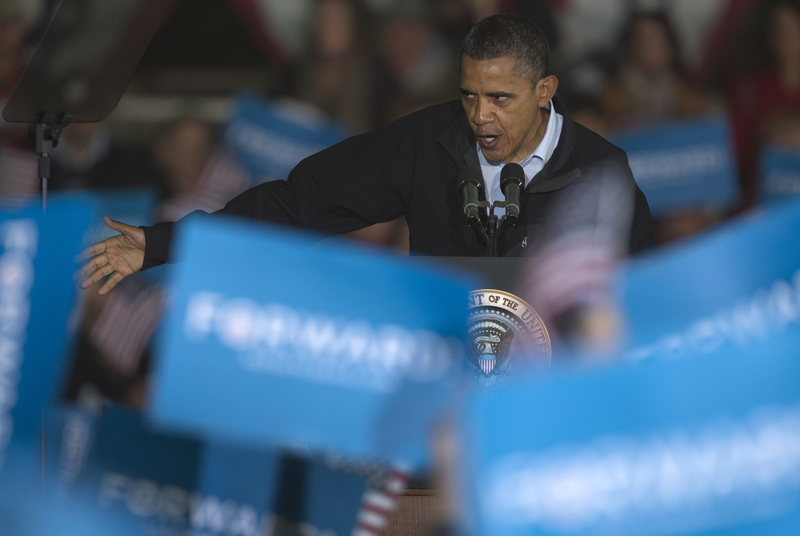 The president's economic pitch in Ohio focused largely on his role in the auto industry bailout. After attacking Mitt Romney for running ads in the tight battleground state claiming Jeep was shipping jobs to China - a claim debunked by Chrysler and GM - Mr. Obama argued the reason the GOP nominee has had "a tough time here in Ohio" is "because he was against saving the auto industry. "And it's hard to run away from that position when you're on videotape saying the words, 'Let Detroit go bankrupt,'" he continued. "And I know you were close to an election, but this isn't a game. These are people's jobs. These are people's lives. So, you don't scare hardworking Americans just to scare up some votes. That's not what being president's all about." Boiling down the choice to an issue of "trust," the president concluded: "After four years as president, you know me. You may not agree with every decision I've made. You may be frustrated sometimes at the pace of change. But you know what I believe, you know where I stand, you know I tell the truth, you know that I fight for you and your families every single day as hard as I know how."